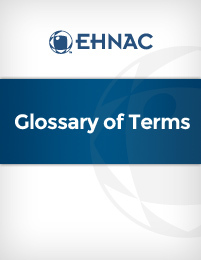 In an effort to further clarify the processes described throughout this web site, we have put together a comprehensive glossary of terms that EHNAC commonly references in our documentation and instructions. Please download the glossary via the link in the sidebar on this page. If you require additional information after reviewing the document, please feel free to contact us.